-Match number 631 for England and number 443 for Holland. - Koeman assumed captaincy after Gullit was substituted. - The teams met a few months later again at the European Championships, with Holland winning 3-1. -On January 26, 1988, Holland manager Rinus Michels agreed to manage West German club Bayer Leverkusen for the following season. -Dutch starting defender Adri Van Tiggelen of Anderlecht was unavaialble for this match. -Dutchman Frank Rijkaard was unavailable for this match, he had recently transfered to Real Zaragoza after walking out at Ajax. -National Team debut for Adick Koot. -Tony Adams scored an own goal for Holland and then also scored for England. -Tony Adams scored the own goal by diverting Jan Wouters’ cross into his own net. - The last match between the nations was on May 25, 1982 also at Wembley, England winning 2-0. For England, Shilton, Sansom and Robson were present at that match, for Holland, Van Breukelen and Muhren appeared at that match, as well as Wim Kieft , though he remained on the bench for this 1988 match. -Marco Van Basten missed this match through injury. -Both managers were past and future managers of FC Barcelona. -Both managers have since passed away, Rinus Michels (9 February 1928 – 3 March 2005) and Bobby Robson (18 February 1933 – 31 July 2009). -Bobby Robson would manage dutch club PSV Eindhoven in the 1990s. -Arnold Muhren once played for Ipswich Town FC and Manchester United FC in England. In fact his manager at Ipswich was Bobby Robson. He was teammates with Brian Robson at Manchester United. -Gullit later played and managed Chelsea FC in England. Hans Van Breukelen was the goalkeeper of Nottingham Forest in England (1982-1984). -Both teams’ goalkeepers were once Nottingham Forest goalkeepers. -Glenn Hoddle managed England (1996-1999). -Match number 441 for Italy and number 588 for Argentina. -This match was held in Zurich , Switzerland, as a special match to inaugurate the 1990 World Cup. The opponents were the host nation (Italy) and the defending champion (Argentina). Pele was a special guest and was at the center circle before kickoff with the respective captains and received a medal. 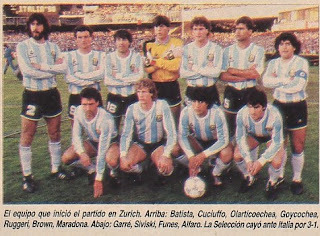 -This was Argentina’s first official match, since becoming World Champions the previous year. -Both Captains (Altobelli and Maradona) were previous World Cup winners. - Alessandro Altobelli captained Italy in the abscence of Antonio Cabrini. - Salvatore Bagni assumed captaincy for Italy in the second half. Therefore for the second half both captains were Napoli players. - Italy's First choice defenders Bergomi, Ferri (both Inter), Franceo Baresi (AC Milan) and Antonio Cabrini (Juventus) all unavailable for this match. -Italian unused substitute Alessandro Renica never played for Italy. - Italian unused substitute Mauro Tassoti would not gain his first cap until 5 years after this match (October 14, 1992-WC qualifier Italy 2-Switzerland 2), which made him at age 32 Italy's oldest ever debutant. -Maradona was clubmates with Italian players: Ferrara, Bagni, de Napoli and Renica. Francini also joined Napoli in the offseason. -Argentinians Ruggeri, Dertycia and Caniggia also joined Italy’s Serie A eventually. -Claudio Caniggia joined Italian club AS Roma in 1992-93 and was a teammate of Giannini. -Stefano Tacconi and Ciro Ferrara’s debut for Italy. - Goycochea , Alfaro ,Sivisky, Caniggia , Funes and Hernan Edgardo Diaz made their national team debut for Argentina. - Argentinian player Juan Gilberto Funes (8 March 1963 - 11 January 1992) passed away less than 5 years after this match due to a heart attack. -Fernando de Napoli’s only goal scored for Italy. - Giuseppe Dossena’s last match for Italy. - Before this match, Italy had not scored a goal in 3 full matches. -Sergio Goycochea started in goal for Argentina as Pumpido was unavailable. -Argentina debutant Caniggia would score the goal vs Italy at World Cup 1990 that contributed to Italy's elimination. -Both goalkeepers were their respective nations' goalkeepers at the penalty kick shoot-out at Worls Cup 1990 between thet two teams. -The last time previous that Argentina defeated Italy was back in 1956. -For Italy’s second goal, Oscar Alfredo Garre deflected a shot from Vialli into the net. -This was the first match between the nations since the previous year’s World Cup. Maradona scored in both matches. -Donadoni, Maradona and Batista became national team managers of their respective nations. -This was the first time since 1982 World Cup vs Brazil, that Argentina had conceded 3 goals in a match. -Argentina’s goal credited to Maradona was actually a volley by Diaz which deflected off of Maradona into the net. Maradona did not actually take a shot. The European based players then joined the squad.